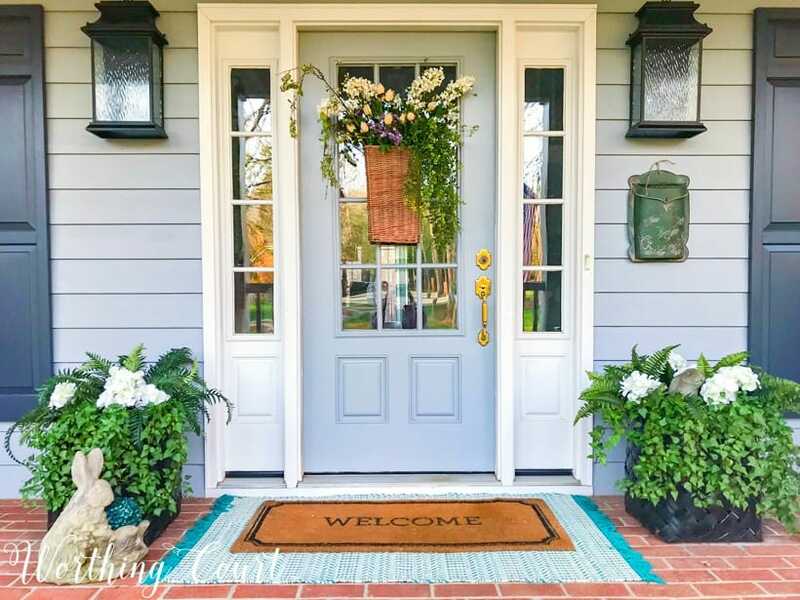 Easy and doable ideas for adding spring touches to your front porch without breaking the bank. Today, I’m excited to be joining my friends for the annual Spring Ideas Tour, put together by my friend Angie from Postcards From The Ridge. Our little group has spent the entire week bringing you spring inspiration for your mantels, tables and so much more! 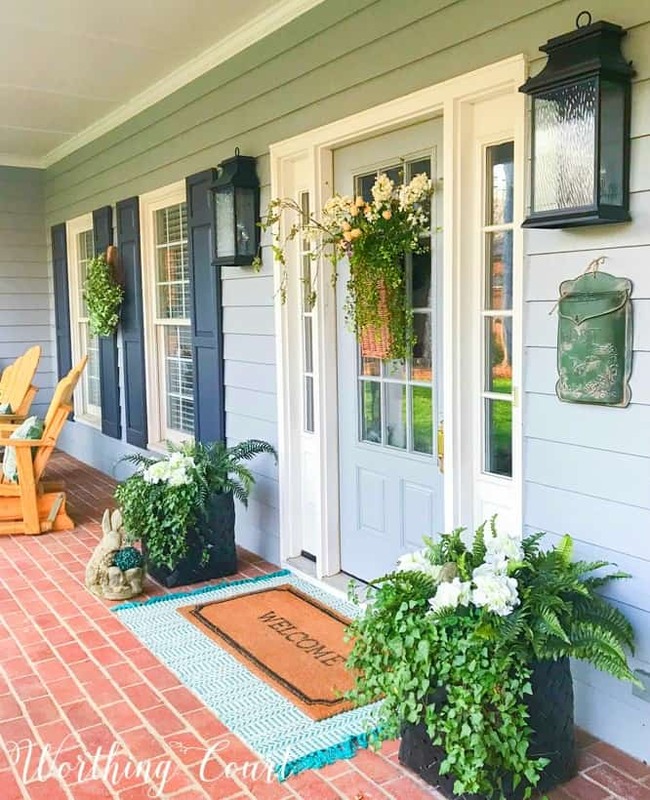 Today, it’s all about porches and we’re going to take look at how I inexpensively decorated my front porch for the season. Welcome! 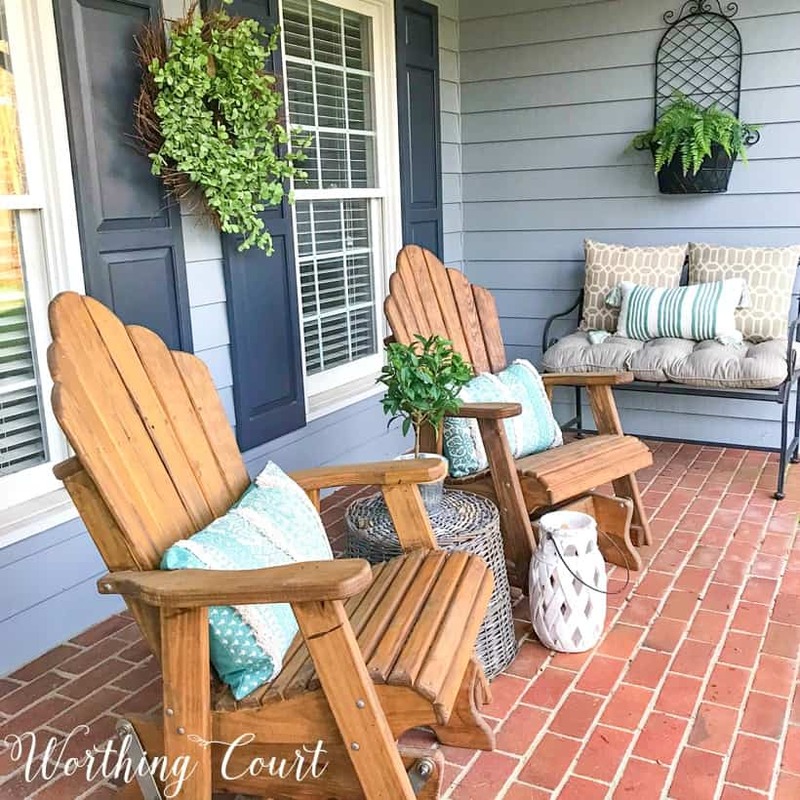 Here at Worthing Court, it’s finally time to get the front porch ready for warm weather living. Every year toward the end of February, I get antsy and start dreaming of warmer days ahead, so it’s time for a celebration when I’m finally able to bring out all of the spring pillows! I’m always trying to decorate on a budget, so to save money, I used the same aqua/blue and cream pillows as last year. But – to add a little freshness and cheer right at the front door this year, I layered a new aqua area rug under the welcome mat. I keep ivy growing in the pots inside of the baskets flanking my front door all year long. By only planting the ivy toward the front of the pot, it leaves room in the back to add any seasonal plants or decor I want to. During the fall I had pumpkins, and at Christmas and through the winter, I had evergreen trees with pinecones and lights. 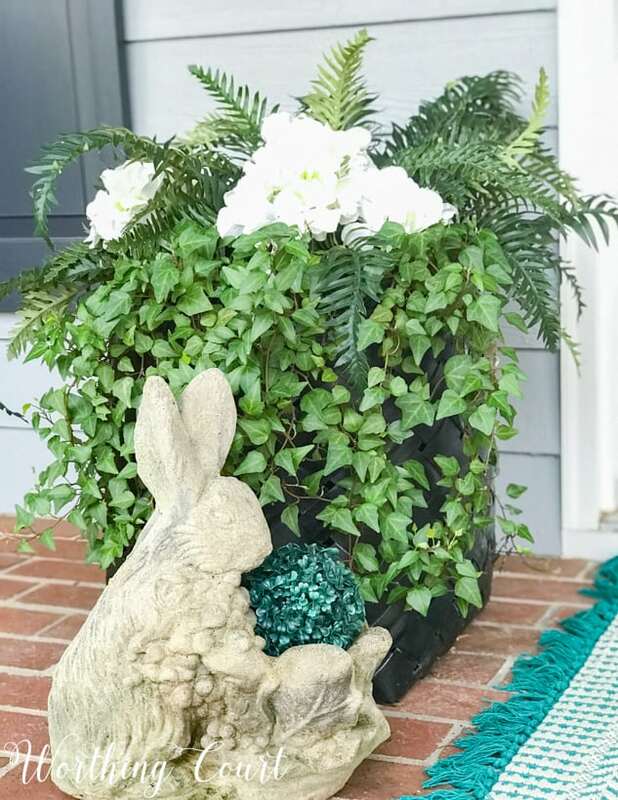 For the spring, I’ve added ferns, a few hydrangea blooms and a couple of cute little concrete bunnies to the mix. And btw – the ivy is real, but the ferns and hydrangeas are fake. Instead of a wreath on my front door, I added a basket filled with a variety of stems and greenery. The trees are just beginning to leaf out here where I live, so the bare’ish stems don’t look like I’m rushing the season too much. Here’s a little secret for you – to keep the stems from falling to the side, I’ve stuffed plastic grocery bags down inside the basket. Ssssh – don’t tell! 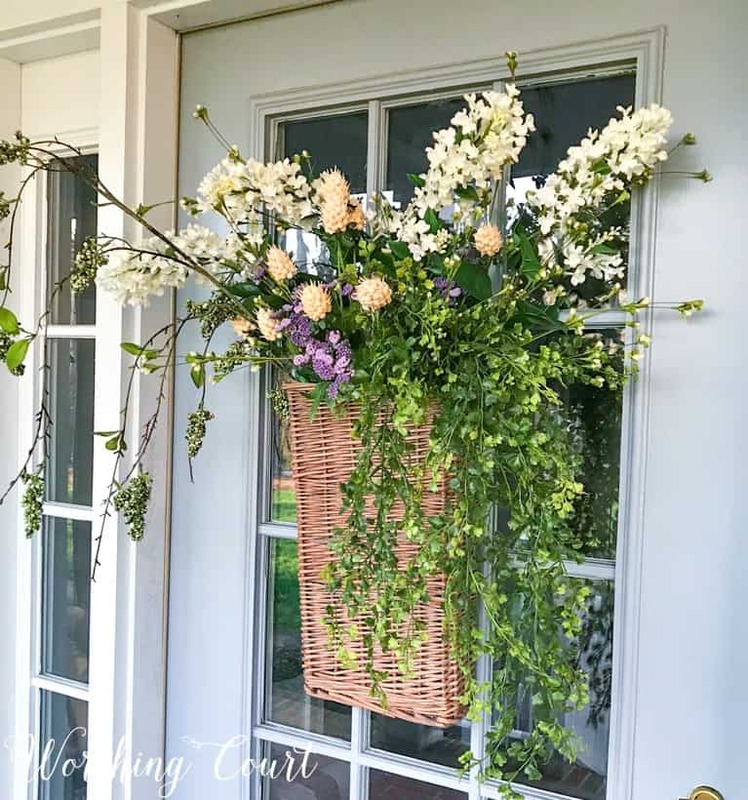 Other simple decorations include a eucalyptus wreath between the shutters of both sets of windows, a cute pretend mailbox beside the front door, simple topiaries on the round tables between the chairs and a couple of white lanterns for an extra touch of brightness. Such simple decorations, but definitely spring worthy! How do you decorate your porch for spring? You’ll want to check out these ideas from my friends for even more spring inspiration! I always enjoy seeing your inviting front porch decorated for each season. I hope you have many happy evenings sitting in your glider this spring! I wished I had blue siding. The porch looks so lovely. OK Suzy…how did we not realize that we were in this tour together while we were at the conference this week???!! So funny. In any event, what a lovely Spring Porch! You are so far ahead of me in getting your home ready to welcome Spring…I need to hightail it home to do the same. Thanks for the inspiration! You gave me lots of great ideas. It was so lovely meeting you this week. I can’t believe that!!! I KNEW you looked familiar to me! It was wonderful meeting and chatting with you! Your chairs look so comfortable. What a wonderful, pretty spot to enjoy the warmer weather. 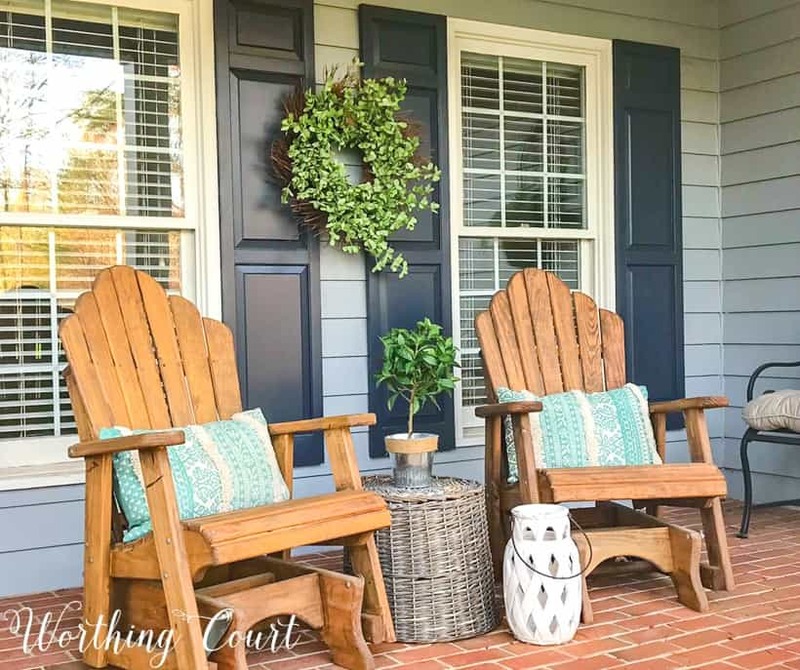 Covered porches are such an asset to a home! Your front porch is gorgeous. I think it would look good all year round but do appreciate all the great creative ideas you have used to change out the season. Happy Spring Suzy! The porch looks fabulous Suzy!!! Love the colors and the basket of beautiful flowers on the door. Thank you, Shirley! Can’t wait to see the new home you’re building! I just know it will be gorgeous. I use vinegar & water for the mildew. Thanks for the suggestion, Sharri! I’ll have to give Simple Green a try. Your porch is so pretty and welcoming. It looks like the perfect place to sit and sip on a glass of iced tea on a warm summer night. Love the arrangement on the door. Thanks for joining the tour. I always love seeing your decorating ideas. Thank you, Angie. I always have fun at the bloghops you organize! Your porch is so welcoming! Very beautiful porch and so inviting! I use vinegar and water and I’ve also had good luck with Magic Eraser on some dingy stains. Thank you, Nancy. Love Magic Erasers! Hi, Suzy! Great content as always. Do you have a link for a source for your front door basket? I love the idea. 1. What size is the aqua rug and where did you find it? 2. Where did you find gliding Adirondack chairs? How comfortable! Hi Lauren. Here’s the link to the rug (I have the 8×10 size): https://www.ballarddesigns.com/bermuda-indoor-2foutdoor-rug/265547?listIndex=23 The Adirondack chairs are from a place in High Point, NC called Amish Trading Post. Oops! I gave you the link to the wrong rug – so sorry! I found the rug at HomeGoods and it’s 36×62 (counting the tassels on each end). Hi your porch is beautiful. What is the paint color on your front door? Hi Jeanine. It’s Sherwin Williams Network Gray. This is so welcoming, Suzy. Beautiful!